Greek food is known for its rich culinary history and use of quality ingredients. Adding a sparkling blue and white banner to the Tiong Bahru neighborhood is Bakalaki Greek Taverna, a new restaurant serving authentic Greek food. This restaurant is an example on how spaces can be aesthetically designed to cast a lasting first impression. Full credit to the interior designer who has done the contemporary decor of the space. Some of the ideas worth mentioning are the barrels on the wall, zigzag wine bottles display, harbor paintings and the blue sofas that adorn the restaurant. There is a seating area in the verandah which would be ideal for brunch and the interior seating would be good for dinner to best enjoy the ambiance. The service was exemplary! We were given an explanation about the dishes, suggested the recommended items, always had the water or wine glasses refilled on time, and were told upfront about the wait time with respect to some items. Before I proceed to share my experience on the food we ordered, let me tell you right away that this place is a must-visit! I was really happy to see that Bakalaki had a lot of vegetarian options on their menu. They also have an elaborate drinks menu in which you can check out the Greek wines. They also sell some products in the retail section in case you are looking for their branded Greek olive oil. While we were in the process of placing our order, we were served complimentary bread which was warm and very good, especially those sea-salt flakes that were sprinkled on the top. There are some dishes that we order by default at a Greek restaurant and one of them is the ‘Pita with Tzatziki’. The refreshing Greek yogurt mixed with cucumber, garlic and extra virgin olive oil acted as a classic appetizer. The pita bread was top-notch and the saltiness enhanced the pairing with the Tzatziki. Do not miss out on trying a cheese dish at a Greek restaurant – either the feta or the halloumi. We ordered the ‘Halloumi’ which was served with lemon and oregano. Grilled to perfection and with the right chewiness, this cheese was satisfying on many levels. But the ingredient that elevated this dish were the cherry tomatoes. Naturally sweet, take a bite of them paired with a small slab of cheese and you will feel an enhanced food experience. Highly recommended and do not miss this if you are a cheese lover. The next dish was recommended by the staff and we were glad that we tried the ‘Tomatokeftedes’ which will surely remind you of a Greek Holiday. These herbed patties were made with Santorini tomatoes which are full of nutrients and have an amazing texture. Even though the patties were charred black on one side, there was no burnt taste experienced while eating the dish. The dish is under the appetizer section but is as filling as an entrée and I would call them as little pillows of delight. Do not miss this dish! The dessert menu was interesting and we tried the authentic Greek dessert called ‘Rizogalo’. 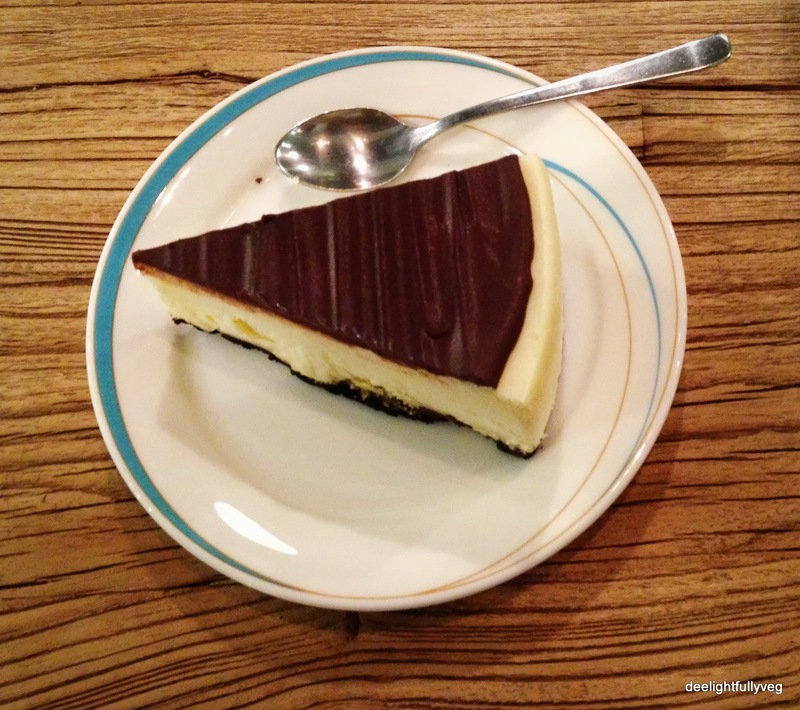 This dessert derives its name from the two main ingredients – rice and milk. It had a dense and creamy texture like a rice pudding and was sprinkled with a gentle dose of cinnamon. We wanted something mildly sweet and this served the purpose. It also helped that it was served in jar which made it extremely convenient to eat the dessert. The simplest of Greek desserts is the ‘Giaourti’ which can be had as a snack at any time of the day. It is basically Greek yogurt served with honey and walnuts and is a simple sweet treat. Since it is made with quality ingredients at Bakalaki with authentic Greek honey, this dish was delicious. The ‘Greek Frappe’ is the hallmark of coffee culture in Greece and is a cool refresher on a hot day. The foam is quite thick and does not mix completely with pure black coffee. Even if you don’t take sugar normally, you will need to add the sugar syrup that they provide to sip the drink. This is for people who really appreciate the caffeine kick. To be honest, I found it difficult to pick out any flaws with respect to this meal. 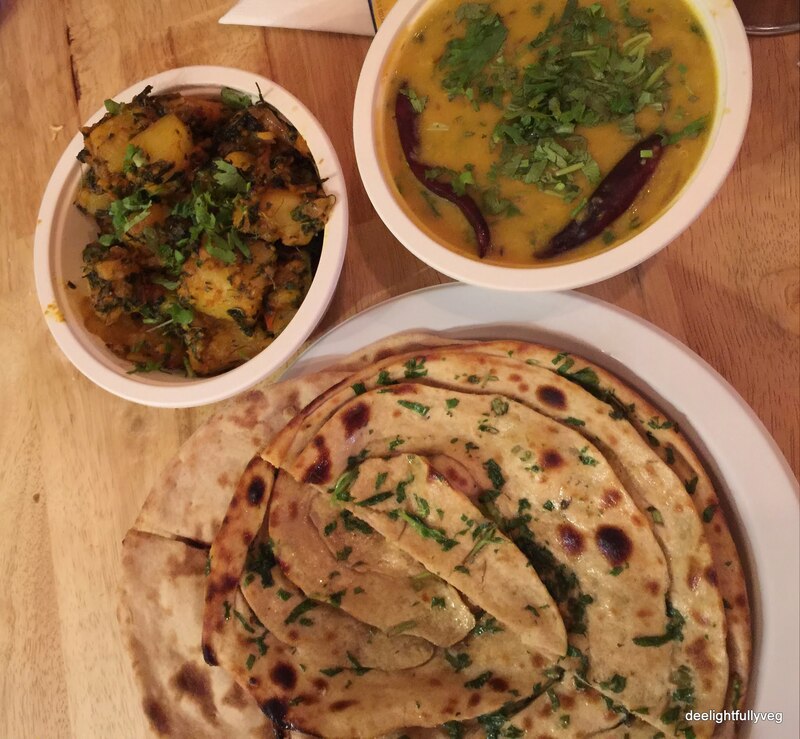 Some dishes may feel a bit overpriced but considering the quality of ingredients used in the dishes, we found the vegetarian dishes to be worth it. Overall, it has turned out to be my favourite Greek restaurant in Singapore. For their authentic Greek food, use of quality ingredients, lovely ambiance their exemplary service, Bakalaki Greek Taverna is highly recommended for an overall awesome dining experience. It’s time for vegetarians in Singapore to celebrate as the Gourmet Greens festival has begun. Running from 23rd – 29th Nov, this festival showcases some of Singapore’s best restaurants taking on an all-vegetarian menu. Priced at $30+(+) for lunch and $45+(+) for dinner, the variety of cuisines that can be tried as part of this week is commendable. 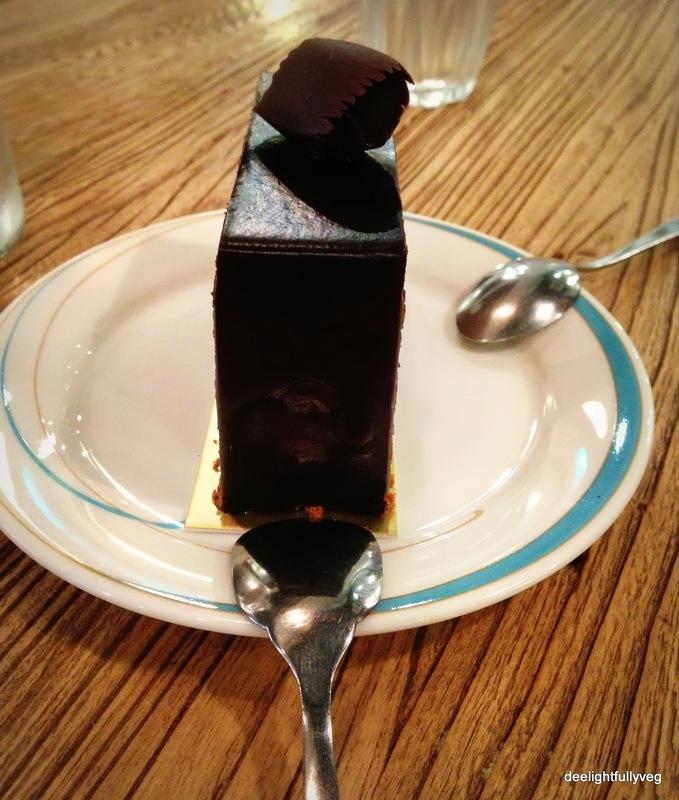 After scanning through all the menus, we decided to try Luxe which is situated along the bustling Keong Saik Road. 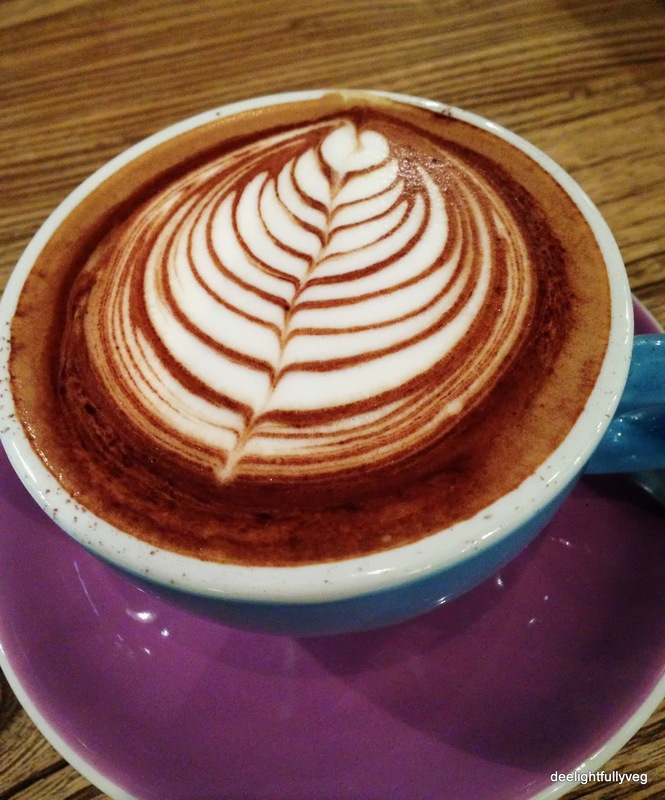 Luxe is a Sydney based cafe that has launched its first outlet in Singapore a few months ago. As we entered the restaurant, we noticed the long bar counter decorated with colorful bottles, Nordic stools, wooden chairs and warm lighting. Its nice to come here for special occasions or date nights. On weekdays, you can definitely enjoy a quiet meal here in peace. The orders were based on the Luxe ‘Gourmet Greens’ menu. It was a five-course meal with interesting options which would be served to you along with a bottle of Fiji water. Reservations are to be made via Chope and ‘Gourmet Greens’ option needs to mentioned during reservation. Our first course was the ‘Parmesan doughnuts’ which came dusted with Parmesan shavings and Parmesan cream. This savoury finger food is as cheesy as it sounds. The cream acted as a good dip and the trademark taste of parmesan hits you in the end. This is a good starter and would pair perfectly with a cocktail. There is a growing trend to make vegetarian food fun and the next dish is a perfect example of delicious food. As soon as the ‘Quinoa and Beetroot Falafels’ were served, the things I noticed immediately about the dish were the pearls of quinoa and the deep red colour of the falafels. The under-salted asparagus along with the minted yogurt lent great balance to the dish. The slightly dry but perfectly crisped falafels when dipped into the thick yogurt made a wholesome bite in the mouth. Full points to this dish, it was perfection! It is tough to get good quality burrata cheese. Burrata is similar to mozzarella cheese but much more enriched in the center. This was an unique combination – ‘Burrata with Grilled Broccoli’ along with pickled cabbage. The broccoli was extremely fresh and green and suited the theme of Gourmet Greens. The cheese drizzled with olive oil was easy to spread and paired well with the veggies. Recommended. Since I am neither a fan of mushrooms nor eggs, I asked for ‘Miso Mushroom rice’ without those ingredients. Since miso is quite polarizing in nature, the taste was quite alien to me and I could not enjoy it much. The sprinkled fried shallots and bokchoy were decent but the whole dish did not combine well for me.This could also be due to the fact that I am not used to having miso regularly. The dessert course was very interesting. On the menu, were the ‘Pandan Madeleines’ served with kaya and coconut cream. Since the madeleines were not green in colour, I think there must have been some amount of pandan infused in it. The kaya mixes well with coconut cream and acts as a perfect base for the madeleines to be dipped in it before taking a bite. Not overly sweet, the madeleines were soft and nicely done. As far as Luxe is concerned – if you are looking for quality ingredients, good food, calm ambiance, good service and for the heart that is put into the food which is visible in the plate, do pay them a visit! And if you are a vegetarian or a foodie, go pay any of these restaurants a visit and celebrate good food! The bustling street of Keong Saik Road is filled with restaurants and cafes. 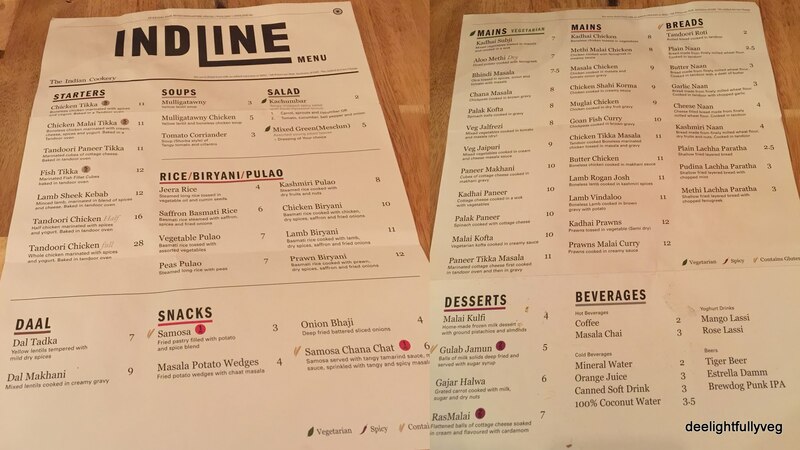 It was a pleasant change to see a quick service Indian restaurant called Indline.Sg open their doors on this food street. They dish out lunch sets, takeaways and timed food delivery (via Foodpanda). It helps immensely that the head chef is an Indian as it lends authenticity to the food. 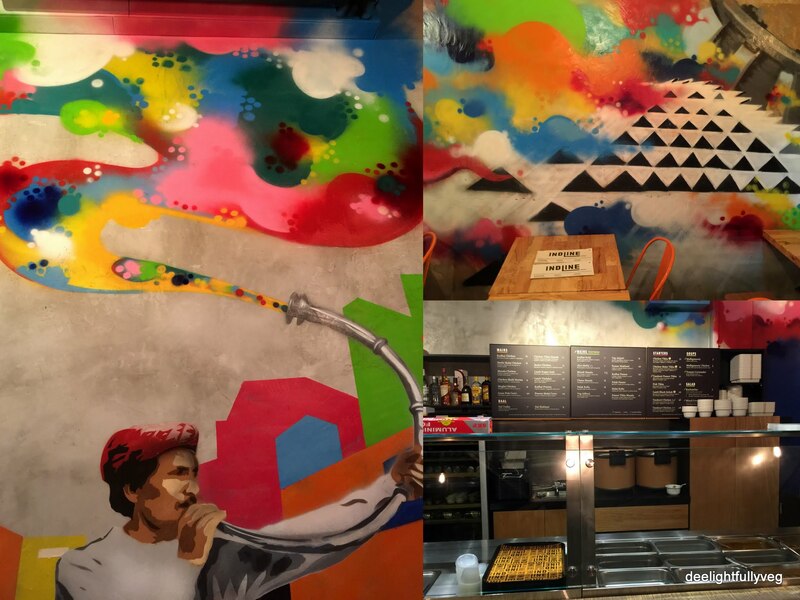 The decor was colorful and interesting sketches are painted across the walls giving it a cool vibe. The music on their website might just surprise you – it took me back to 80’s – 90’s Hindi film music era. It is always interesting to see the variety of dishes in an Indian food menu. Indline did not disappoint in this respect. 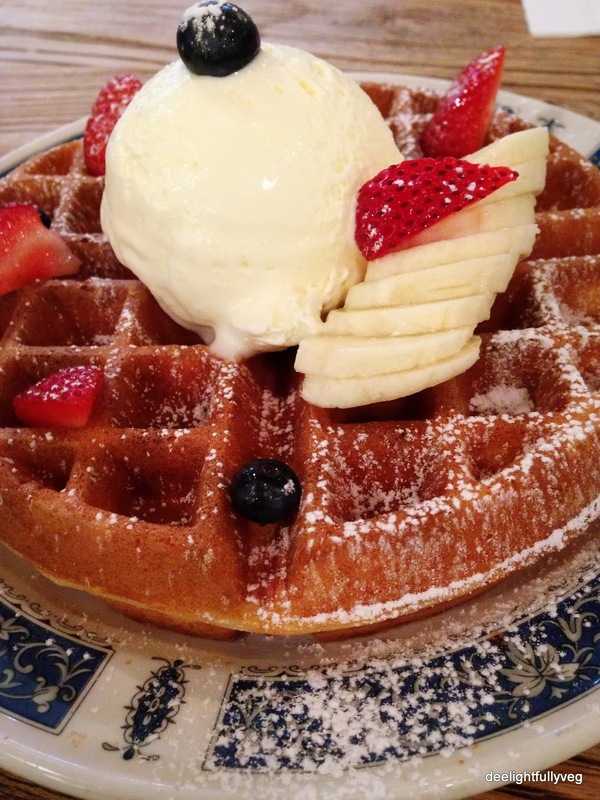 The dishes are neatly priced making it a total value for money. Pakodas and Bhajis typically are the most liked Indian food starters. 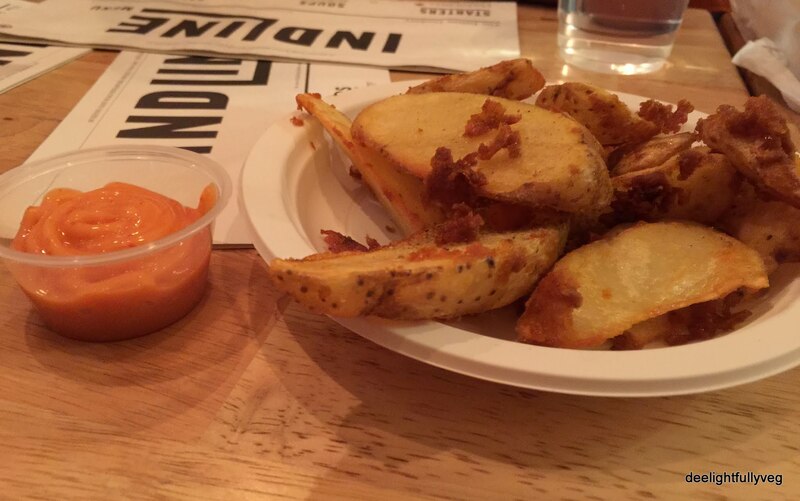 Though we were tempted to try it, we ordered the ‘Masala Potato Wedges’ to tantalize our taste buds. The Indian spices hit the right note in this snack and it was an enjoyable starter. Since we went for dinner, there were no set meals. We had to individually choose the items and make our own quick meal. 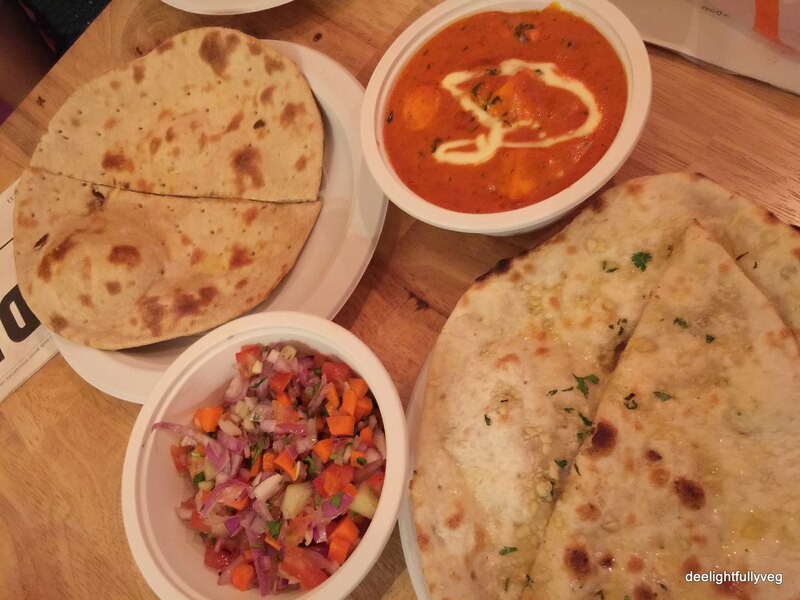 Cottage cheese/ Paneer curries are generally worth a try in a new restaurant. We ordered ‘Paneer Makhani’ which is basically cottage cheese cubes cooked in a creamy gravy. The gravy was very tasty and the dish is worth ordering. The Kachumbar (salad) was fresh and the vegetables were finely chopped. The Tandoori Rotis reinforced the Indian feel of the dish. Personally, it reminded me of being closer to a ‘dhaba’ version. The quantity was sufficient for 2 pax. The next combination that we customized as a meal consisted of ‘Pudina Lachcha Paratha’ which is a shallow fried layered bread with chopped mint. In a Lachcha Paratha, you should be able to see the layers neatly stacked and rolled which was visible here. To pair along with this, ‘Dal Tadka’ and ‘Aloo Methi’ were ordered. The Dal was wholesome and delicious to have just on its own. The Aloo Methi could have been better as the potatoes were a bit under-cooked. For desserts, don’t miss the ‘Kulfi’ which was sweet joy on a stick. As it melts fast, it is better to focus on eating it than clicking a pic which is what happened with me 🙂 They are also launching ‘Rabdi’ as part of their Deepavali dessert dishes which should be interesting as well. I definitely plan to visit them again to try their rice dishes and desserts. For their wallet-friendly prices, authentic and good Indian cuisine, hassle-free service, Indline.Sg is definitely worth a visit!